Even if you’re not that huge into football, it’s likely you’ll have at least heard the name Bert Trautmann kicked around at least a couple of times. Being the non-footie person that I am, who for the record hated every single time they played that irritating 3 Lions song on the radio during last summer’s World Cup, I didn’t know a single thing about the guy before sitting down to watch The Keeper, and afterwards I could kind of see why he’s considered such a fascinating figure. His story is nothing more than remarkable; a German soldier fighting in the Second World War, he was captured and placed in a POW camp in Lancashire, where he was discovered to have a strong ability to act as goalkeeper during games of football. He eventually went on to play for Manchester City, despite initial controversy over his past as a decorated Nazi, and became one of the sport’s most admired faces, even during incidents that will be touched upon later in this review. It’s truly inspiring stuff, and the movie that depicts it all as best as it can is a rather nice surprise; it’s entertaining, interesting, likeable, and feels absolutely genuine in its emotion without feeling too sickly sweet or uncomfortably forced. The movie focuses on Trautmann (David Kross) when he’s situated in said POW camp with fellow captured German soldiers, subject to denazification by the overseeing British officers, including Harry Melling as the German-hating Sergeant Smythe. His talents for goalkeeping are discovered by Jack Friar (John Henshaw), the manager of the local St Helens Town football team, who initially recruits Trautmann for his team as part of a self-serving deal, but soon discovers the German’s true ability on the field. Trautmann eventually goes on to woo and later marry Jack’s feisty daughter Margaret (Freya Mavor) with whom he starts a family, all while seeing his past as a Nazi decorated with the Iron Cross overcloud his later signing with Manchester City, as well as previous traumas from the war come back to haunt him. As someone who, again, knew absolutely nothing about Bert Trautmann before this movie, I have to say that I was not expecting such a rollercoaster of emotions going into it. The movie sets his story up as an inspirational tale of overcoming adversity, but it doesn’t sugar-coat any of its darker moments either; you see archive footage of dead bodies being loaded off of trucks during the war, as well as people being shot in the head and people cursing harsh obscenities towards the German player, and later there is even some truly crushing heartbreak that’s handled more carefully and with more honesty than a movie advertised as a mere feel-good movie would have you believe. I really appreciated that this was a movie that went for the more adult 15 certificate, with people casually dropping profanity left and right, and the harsher moments of violence not being pushed to the sidelines, which really gave it a more genuine feel to it than if it was a 12A instead and have most if not all of that completely watered down. In doing so, the movie not only feels truer to life without pandering to a more mainstream audience, but it also shows all the sides of this story without coming across too forced or crammed in; I was completely engrossed in this movie as a result. The performances are all outstanding, with Kross giving a meaningful lead performance as Trautmann that prevents the character from ever being too dull or bland, and he shares some sweet chemistry with Freya Mavor who’s a force of her own in a role that also benefits greatly from the 15 certificate as it allows her character to be able to talk about heavier subjects without filtering things for the sake of a wider audience. It’s also shot rather well, with director Marcus H. Rosenmüller – who apparently met with the real Trautmann before his death in 2013 to obtain notes for his in-development passion project – injecting life and meaningful humanity into scenes that you never would have expected them to appear, which in turn makes the story seem all the more likeable and honest. There are a couple of pacing issues – Trautmann and Margaret are just suddenly married in a slightly confusing transition from one scene to another, and the second half of the film does sometimes rush through Trautmann’s football career – but it’s focused enough to leave you interested in this character and his very inspiring story, especially his defining moment during the final of the 1956 FA Cup that is depicted in all its tense glory. I truly didn’t expect to get this much out of a film about a subject I know next to nothing about, but it’s refreshing to learn a bit more about this guy, who this movies makes out to be the real deal when it came to playing the game beautifully, and who I never would have actively gone out of my way to educate myself about otherwise. It’s a real surprise of a movie, and one that makes me a little sad that it’s not getting as wide a release as it probably should; it’s a truly inspiring story about a fascinating figure that’s handled gracefully, and given a real sense of honesty and genuine emotion that nobody could ever predict would come from a movie about a certain figure from the world of football. I’m really glad I saw this, and I hope that it does find an audience of some variety, because it deserves to be seen by far more people than it’s probably getting at the moment. 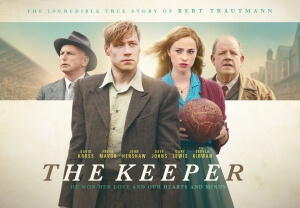 The Keeper is a real surprise of a movie, which handles the fascinating and endlessly inspirational story of legendary goalkeeper Bert Trautmann with genuine emotion and a real sense of honesty, and tells his tale in such a compelling and well-performed manner that even the biggest football cynics will find difficult to hate.